During international assistance dog week in 2018, we took part in a very successful campaign with “Tierisch Engagiert” from Fressnapf. Within a few days, nearly 2.000 selfies were posted with the hashtag #AssistanceDogWelcome. Fressnapf donates 1 Euro to Pfotenpiloten for each photo posted with this hashtag. And the campaign will continue! 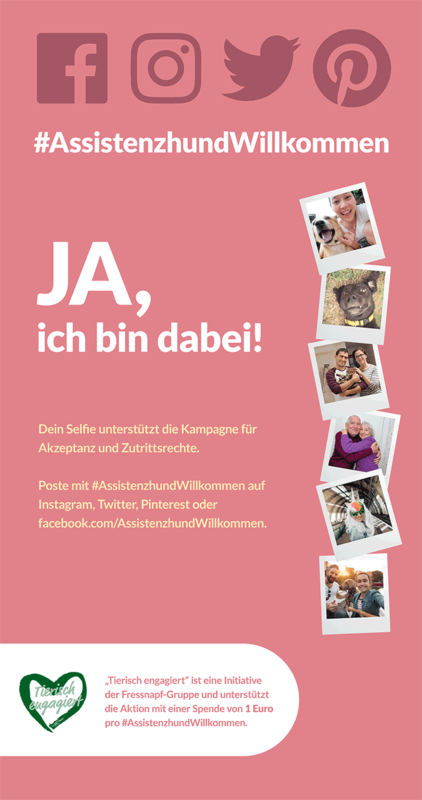 Please post a selfie with #AssistenzhundWillkommen or #AssistanceDogWelcome (this is important, otherwise we can’t see it!) on Instagram, Twitter or Pinterest. Or post it directly on this page: </br>Facebook.com/AssistenzhundWillkommen. We want to create a culture of solidarity with assistance dog teams with this campaign. Please be a part of it! Visit our exhibit that is touring Germany and add your colorful finger print to our large dog paws, as a sign of solidarity. Each finger print says: “I support that assistance dog teams should be accepted and supported.” In addition, your finger print will support our accessibility campaign with Tierisch Engagiert, because they will donate 1 Euro per finger print.